When originally soldering the PCB I applied no-clean flux. Just in case, this morning I resoldered (actually just heated up with my soldering iron until solder became liquid again) all 7 PCB dots and the power wire (but not the sense wire, too 'sensitive' a location). I rechecked again with my multimeter that there are no false contacts. I tried them all, but which one should I use? PS: I have plenty of soldering experience after having done nearly 100 SATA-mods and over 100 LED-mods. RealBlackStuff wrote: I tried them all, but which one should I use? FHD display corresponds to Digital 2 on dock, but there's no point selecting it until you get the image on it. So the FHD screen is recognized somewhere! I'm doing this LCD-test using the attached external monitor (a 15" XGA NEC, 1024x768, got there with Fn/F7), while the backlight/screen of the FHD are OFF. Huh???? Should I already set the Dock 2 option? Dock 2 option should be used to choose new FHD display as primary display. That means when FHD is connected and you connect external monitor, you won't get image on external monitor when booting. By default, external monitor is used instead of internal. So, there's no point to change that right now. Which OS do you use right now? I suggest we stick with Windows so that I can understand what are you doing. OK, I've set the BIOS display back to Thinkpad-LCD. When I boot without HDD, the X230 goes automatically into the Boot Menu/Application Menu. The above Lenovo display test is part of the: Application/Menu/Lenovo Diagnostics. I am using a HDD with W7Pro/SP1 in 32-bit. If I boot into W7, the Fn/F7 no longer functions and the FHD stays off. RealBlackStuff wrote: OK, I've set the BIOS display back to Thinkpad-LCD. Weird, can you see if the image is shown in the FHD when the backlight is off (you can see it with very clear ambient light)... It's that W7 working when you connect the old PANEL? On which screen did you read that? RealBlackStuff wrote: If I boot into W7, the Fn/F7 no longer functions and the FHD stays off. Go to Control Panel\Appearance and Personalization\Display\Screen Resolution and see what displays you have. The old IPS screen (and W7) still works fine if I connect it instead of FHD. The Lenovo LCD-test is part of the X230 BIOS. As I already mentioned, the "1920x1080 test-result" was displayed on the external monitor, while the FHD was off. (Can't have both on at the same time). In the meantime I have installed the Intel GPU 4000 drivers from Lenovo (g1d556ww.exe). In Control Panel I have no Appearance, only Personalization (also accessible in W7 by rightclicking the desktop). 3. is the big one. Multiple displays: Extend desktop to this display. Multiple displays: Disconnect this display. But you should have got an image right after the first start. Something is wrong. Let's troubleshoot it this way. That means there is no video signal going to FHD panel (on the motherboard side). Or, that could also mean that you choose fake LVDS display and not FHD. If you boot with FHD and external monitor, does Windows allow you to use 'Extend these displays' option over 'Mobile PC display' and external monitor? On Dummy (1) and Mobile-FHD (2) the Resolution and Orientation are greyed out. They are grayed out because they are disconnected. 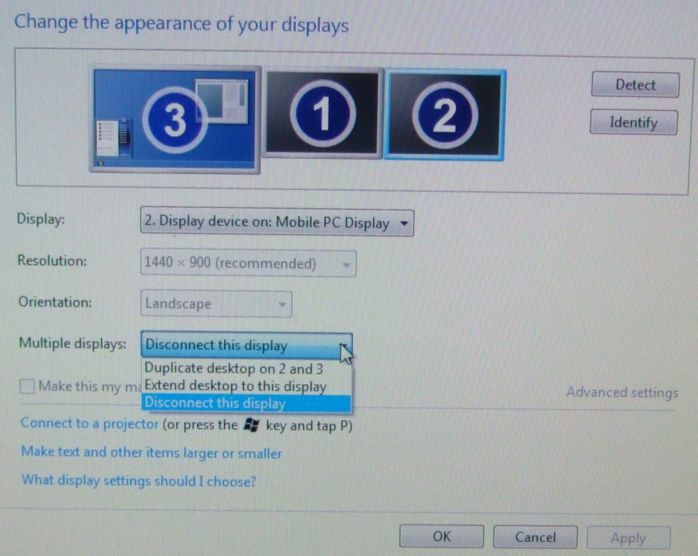 If I select Mobile display and Choose 'Duplicate desktop on 2 and 3', the upper Display field changes to: "2/3 Multiple Monitors"
And when I try to Apply it (or save anything) it says"Unable to save display settings". While I'm trying any of this this, the FHD backlight stays on all the time! I got similar results with isolated data lines (DOCKB_DP0 and DOCKB_DP1), but without backlight on FHD display. Windows does recognize it but can not save display settings. Check continuity between 4 solder points corresponding to DP0/DP1 and display side connector on the eDP cable. RealBlackStuff wrote: I'm lost here, sorry. Both upper-left and bottom-left in that circle do not even connect to the LCD-connector on the PCB! All other 5 7 solder-points do. They should go to pins 6-7, 1 being top left. Do those pins look correctly soldered on the connector ? All 7 solder-points do connect to the LCD connector. But both upper-left and bottom-left in that circle do NOT connect through to the LCD-connector on the LCD-side. Then I checked the LCD-cable itself. That has the same problem, so I think the LCD-cable may be to blame. Pinouts are slightly different between two ends. Are you absolutely sure? Those 2 pins 6 and 7 do NOT feed through the cable from PCB to LCD. I have the LCD-pinout but not the PCB-pinout. So what goes where in that cable? RealBlackStuff wrote: Those 2 pins 6 and 7 do NOT feed through the cable from PCB to LCD. I guess you measure that with FHD LCD connected to the adapter board, right? RealBlackStuff wrote: So what goes where in that cable? First 11 pins match on both ends, so pins 3,4 on the board side must be connected to pins 3,4 on LCD side. Similarly, pins 6,7 and 9,10 on the board side must be connected to pins 6,7 and 9,10 on the LCD side. After trying everything, in every direction, with or without LCD-cable, pins 6 and 7 do NOT connect to the LCD. So it's definitely a bad LCD-cable. OK, I'm going to send you a replacement cable. That's great, thanks ever so much! After getting backlight working on the stock display, there's still no backlight at all on the FHD display. It seems to work otherwise, it shows a picture. I managed to destroy the pad on the adapter board that goes to DOCKB_HPD. Could that be the cause? Are you getting no backlight in the OS only or in the BIOS too? Might be fried MCU on the adapter board - it happened to another user when he hot plugged one of the LCD cables.